The yellow-green texture polish I've used here is Deborah Lippmann I Wanna Be Sedated (Amazon, Deborah Lippmann). I gotta give props to Deb for taking a risk, not only in making a creme texture but for also making it in such an weird color. I keep going back and forth between loving how interesting this shade is and being unsure about how it actually looks on me. As far as application, it went on easily, needing just two coats. On the two outside nails I've used three coats of Dandy Nails Bound to Fall as the base. This polish is a beautiful medium-dark grey with a flecked appearance. As far as grey polishes go, this one is a winner! Then I added one coat of Cirque Vectors over the top. Vectors has different shapes and sizes of black matte glitter plus just a touch of sparkle. It's really great and the glitter is plentiful. I finished the look with two coats of American Apparel Hassid to my thumb to create the grounding black accent. I love when a manicure makes me think twice. This ugly-pretty texture might be a bit too much on its own, but I do like the way it works in with the other elements of this manicure. What do you think: too weird for you or just edgy enough? super edgy!! I really love it - textured and weird color in one polish?! sounds like a winner to me! Incidentally, Bound to Fail is one of my fave polishes in my stash. The flecks almost make the polish finish look fuzzy? I really love it. So glad you like it! Bound to Fall is really beautiful, I imagine it will become one of my favorites, too. I love the color combo you used. Also, I am usually not a huge fan of yellow anything, but this textured polish is gorgeous! Love it. I'm not generally a fan of textured polish, but this one really appeals to me.I like that it isn't shimmery or glittery and just lets the texture and color do the work. I like the contrast between the bright texture and the grey polish - I am not a fun of creme textures but somehow in this shade it works! i love that texture polish! OMG, I'm in love! I Wanna Be Sedated is almost like a texture version of one of my TOP 5 POLISHES OF ALL TIME (yes, for real! ), OPI, Don't Talk Bach To Me! I absolutely adore these "ugly" greenish yellows and to add texture just pushes it over the top. I don't own any DL polishes because they're a bit over my price point but I might have to make an exception for this one! I love your pairing it as you did, it really pops and hi-lites the texture! Wow! i like it, I want it, I need it, I love it! I love it!!! I don't have a green texture polish like that, but I want to recreate this with a non-textured weird green! Thanks for the idea!! Love! My fave green of all! I actually really love that DL polish it's gorgeous! Oh I thought that was the China Glaze textured ones. Eh, still not on board with those! I think the best part of texture is the matte sparkle. Plus this color just keeps reminding me of guacamole. I realllly love that Vectors glitter though and the grey base. Mmmm! I am quite liking the whole look. ESP the DL, although I don't quite the green-yellow, I thinks it's looking very pretty on your nails .. ! 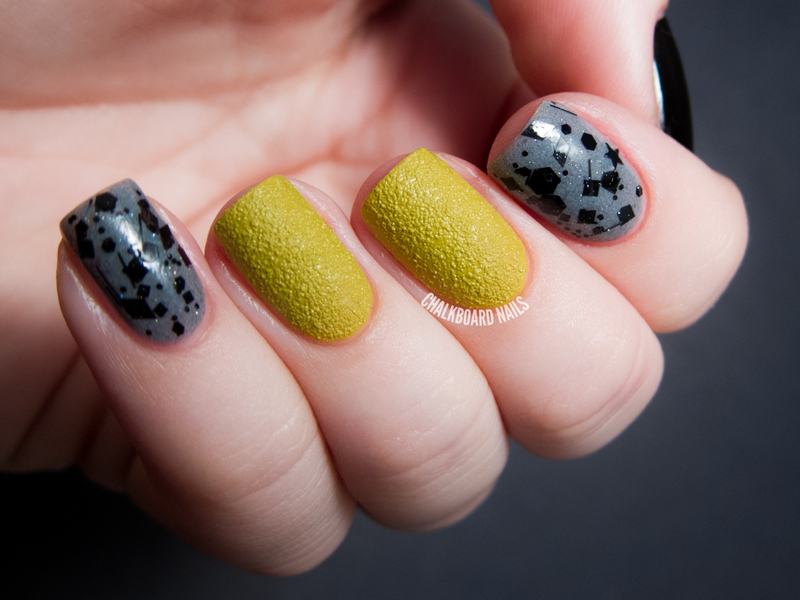 I love this manicure, especially this yellow-green Deborah...wow! I think if I just saw the polish swatched, I wouldn't like it. But of course, you find the perfect way to incorporate it into a manicure! I love this! Just perfect! WOW i am in love with that polish, its so unique! i love how you wore it! Weird enough for me! Love this shade on you, but is always makes me lobster-y.. I am intrigued by the textured polishes. I have a black and a white, and I've swatched them, but not worn them yet. I think I would be touching my nails all day, lol! I like the creme textureds. I have been thinking it would be neat to do nail art over the textured effect. That would help with the color issue, I think. I like your take on this one, pairing it with the grey, black and glitter. Well-done! Amazing! I love the textured nail polish. Honestly, whoever invented those scales should be killed. which usually geek shirts encapsulate. cobtinues to stay up to his red boots. Thanks for finally writing about > "Punk Vectors - Texture and Glitter Combo"